'Live' from the KUVO Phyllis A. Greer Performance Studio at 4pm on Monday, October 6th. Featuring Purnell Steen and Le Jazz Machine, with guest artists Bob Harris on vocals, Myra Warren on vocals, and special guest artist Cody Moffett percussion! 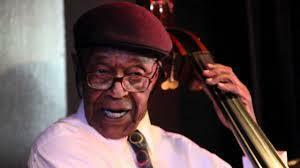 This will be a Tribute to Mr. Burrell who officially turns 94 on Saturday, October 4th. Studio Club members please RSVP to Arvida Rascon by email to arvida@kuvo.org, or phone 303-446-7631. To become a Studio Club Member click here! Thank you! What inspired you to listen to jazz? What inspired you to listen to Jazz? A family or friend? A memorable performance or recording? Connect with us at facebook.com/jazz89 and share your Jazz story. KUVO's hosts tell us their stories. What about you? What do you just love about this music! Tune in to KUVO Monday afternoon, 3/24 at 4pm when Colorado Symphony Orchestra conductor Andrew Litton joins Erik Troe in the KUVO studio. Litton, an accomplished pianist, is releasing a new CD, "Tribute to Oscar Peterson" and will talk about the record and play some selections live on the air.